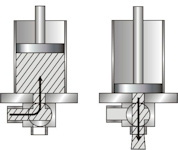 Volumetric filling machines are based on a self-priming cylinder. A piston is moving inside this cylinder and the stroke length and diameter of the piston determines the filling volume. Gravimetric filling machines are weighing the exact weight using a valve that is placed over an electronic scale. The scale in combination with the weighing program controls the valve operation resulting in a weighing process. Product properties – If the product contains e.g. air bubbles, volumetric filling is normally not recommended. Desired volumes- For volumes above 20 ltr. we always recommend a gravimetric solution. Available budget – A gravimetric solution is in general more expensive.